Wow! What a great idea for any event. 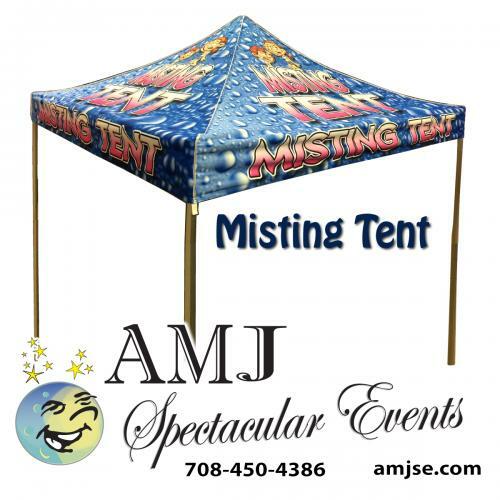 Stay cool on those HOT days with our misting tent. No power needed! You will need to provide a constant water flow to the tent. We will make the hose connection, turn on the water and watch the misters work their magic. Misting tents are the best way to say cool. Addison IL, Algonquin IL, Alsip IL, Arlington Heights IL, Aurora IL, Barrington IL, Bartlett IL, Batavia IL, Bellwood IL, Bensenville IL, Berkley IL, Berwyn IL, Bloomingdale IL, Bolingbrook IL, Bridgeview IL, Broadview IL, Brookfield IL, Buffalo Grove IL, Burbank IL, Burr Ridge IL, Carol Stream IL, Carpentersville IL, Cary IL, Chicago IL, Chicago Heights IL, Chicago Ridge IL, Cicero IL, Clarendon Hills IL, Countryside IL, Crystal Lake IL, Darien IL, Deerfield IL, Deer Park IL, Des Plaines IL, Downers Grove IL, Elgin IL, Elk Grove Village IL, Elmhurst IL, Elmwood Park IL, Evanston IL, Evergreen Park IL, Forest Park IL, Forestview IL, Franklin Park IL, Geneva IL, Glen Ellyn IL, Glencoe IL, Glendale Heights IL, Glenview IL, Golf IL, Hanover Park IL, Harwood Heights IL, Hazel Crest IL, Hickory Hills IL, Highland Park IL, Hillside IL, Hinsdale IL, Hodgkins IL, Hoffman Estates IL, Homer Glen IL, Indian Head Park IL, Inverness IL, Itasca IL, Kenilworth IL, LaGrange IL, LaGrange Park IL, Highland Park IL, Indian Head Park IL, Justice IL, Lake Forest IL, Lemont IL, Libertyville IL, Lincolnwood IL, Lincolnshire IL, Lisle IL, Lockport IL. Lombard IL, Long Grove IL, Lyons IL, Maywood IL, Medinah IL, Melrose Park IL, McCook IL, Midlothian IL, Morton Grove IL, Mount Prospect IL, Mundelein IL, Naperville IL, Niles IL, Norridge IL, Northbrook IL, Northlake IL, North Riverside IL, Oak Brook IL, Oak Brook Terrace, IL, Oak Forest IL, Oak Lawn IL, Oak Park IL, Orland hills IL, Orland Park IL, Palatine IL, Palos Hills IL, Palos Heights IL, Palos Park IL, Park Ridge IL, Plainfield IL, River Forest IL, River Grove IL, Riverside IL, Riverwoods IL, Rockford IL, Rolling Meadows IL, Rosemont IL, River Forest IL, Romeoville IL, Roselle IL, St. Charles IL, Schaumburg IL, Schiller Park IL, Skokie IL, Stickney IL, Streamwood IL ,Stone Park IL South Barrington IL, Summit IL, Villa Park IL, Warrenville IL, Waukegan IL, Wayne IL, Westchester IL, Western Springs IL, West Chicago IL, Westmont IL, Wheaton IL, Wheeling IL, Willowbrook IL, Willow Springs IL, Wilmette IL, Winnetka IL, Winfield IL, Wood Dale IL, Woodridge IL, Yorkfield Illinois. We do service additional areas on a case-by-case basis.